Kid communities are a critical part of growing up and learning to survive. Having a network of friends was and still is a critical part of how you can identify with a group, what you can contribute, and where you fit in. I moved around a lot as a kid, which was vastly different from most people I knew growing up. This constant change of environments, personalities, and friends brought me to a specific conclusion by the end of high school that has helped me through life by establishing a simple value system, work ethic, and sense of responsibility. That value system is what every group needs to know and understand through and through: that communities change, skills change, and responsibilities change. Listen to this broadcast or download “Kids Communities – Part 2: The Pack” in player below! 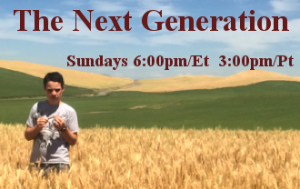 This episode of The Next Generation Show, we will be discussing how similar the natural wolf pack hierarchy is to basic kid communities and what you can do as a parent to encourage healthy involvement with a group versus unhealthy involvement. We will demonstrate two different types of groups – one as a positive influence and another as a negative influence – and some of the reasons and signs that you can pay attention to in order to curb some of the unhealthy connections your kids make without knowing it. By establishing the sense of community early on and reinforcing the importance of quality connections and friends, you can help guide your kids toward a path of self-sufficiency while maintaining an identity within a group, and using a group to uphold your self-sufficiency. Plus, for the Pint-Sized Prepper Project of the week, we’ll be demonstrating the importance of community by building an every-day-carry Altoids tin for kids that can be used as a teaching and learning tool to show how EDC items work together to strengthen a whole. They can be tailored to the specific needs of your kid during their school year, and are a great way to introduce kids to being prepared! Previous: Previous post: Emergency Bag Basics! Next: Next post: Repressive Tolerance! 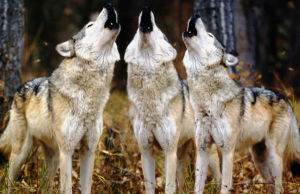 Wolf fathers spend the daylight hours away from the home – hunting – but return every evening. 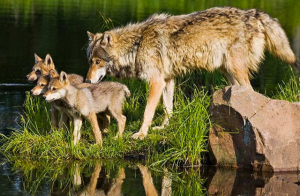 The wolf cubs, five or six to a litter, rush out of the den when they hear their father approaching and fling themselves at their dad, leaping up to his face. The father will back up a few feet and disgorge food for the cubs in small, separate piles.